The Jomo Kenyatta International Airport (JKIA) in Nairobi. East Africa and Africa in general has recently developed a rather strange new appetite for national carriers. Every government is finding weighty reasons for why their country needs a public financed national carrier. Never mind that they actually had these airlines but a combination of incompetence, abuse and inability to put up with competition killed most by the early 1980s. Proponents of national carriers argue that they make up an important aspect of the nation's infrastructure. Because air transport is an economic enabler that often determines the competitiveness of different segments of an economy, having the power to influence how services are priced in that market has always been a compelling weapon in the arsenal of its supporters. Yet recent experience and the conduct of people trusted to run the business not only obscures but undermines some of the most compelling arguments in support of these airborne crown jewels. Take case of East Africa. For a decade, the defunct East African Airways jointly owned by Kenya, Tanzania and Uganda, was regarded as an example of successful African aviation. Even today, in the face of financial difficulties that national carriers are wrestling with, many who look back with nostalgia to that era are tempted to think that a supranational airline could be the silver bullet for struggling aviation sectors. Despite some inherent advantages such a consolidation of the market could deliver, it does not really address the factors that cause national airlines to fail. Poor strategies, extractive behaviour by management and political interference rather than the market appear to be the real culprit. Until about five years ago, Kenya Airways had grown to be one of Africa's few bankable airlines. 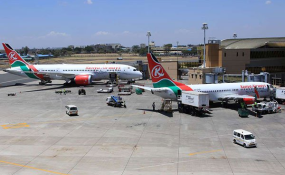 Yet today, even after multiple government bailouts, it is struggling to keep its head out of the water, desperately groping for a life raft in the form of a takeover of Nairobi's Jomo Kenyatta International Airport. This was the consequence of misapplying the airline's resources in pursuit of a plausible but ill-executed expansion strategy. Now, Polish turnaround expert Sebastian Mikosz, who was brought in to save the carrier from going under, is placing his last bet on securing approval for an integrated KQ/Jomo Kenyatta International Airport operation. Farther afield, Tanzania, which has managed to put together a fleet of gleaming new aircraft, is struggling to put these jewels to profitable use. A single Boeing 787-800, an aircraft that can reach almost any point of the globe nonstop, is yet to be deployed on a fitting route. RwandAir is punching its way through a critical growth phase while in Uganda, after achieving consensus on the revival of a national carrier, execution is proving problematic because of the poor understanding in some quarters, of the complexity and sensitivity of such a project. Still, blaming the failure of African aviation on factors other than its real cause will not save national airlines from becoming white elephants.